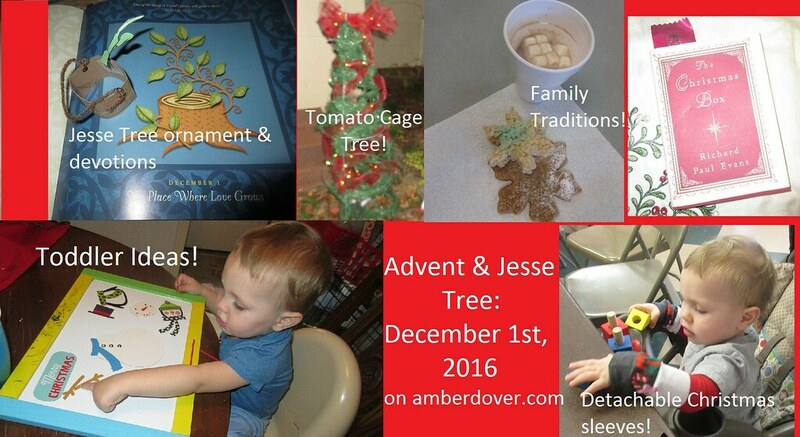 In this post: Our Advent activities for day one, and our Jesse Tree devotional. We’ve got snowflakes, a tomato cage tree, beloved traditions, and toddler play ideas! Hello, dear ones! How are you? Are you celebrating Advent too? This year I want to celebrate with you by sharing our daily activities and devotions. I will be a couple days behind, but that keeps me from rushing to post every day. We decorated for Christmas the day after we got back from Texas. Leeland helped hang the star and the guys put ornaments on the tree. Michael helped with the Christmas village and one of the Nativity sets. The village is special to me because it reminds me of how I’d help my grandma (Mema) set up her Christmas village in her bay window. I looked forward to it all year. I let Michael put up his own village in his room. Here’s our Advent tree that we painted a year or two ago. I put slips of paper with our daily activities in the drawers. The only Advent I had as a child was a small Christmas tree music box that had drawers on the bottom. There was a tiny ornament in each drawer and my Mema (grandmother)let my cousin and I take turns putting on the ornaments. The cardinal painting has a story that I hope to tell at another time. We decorate our rooms too. You can see our Jesse Tree and Advent wreath with candles on the kitchen table. The Jesse Tree is the only tree that starts bare and becomes full on Christmas day. Now time to share with you our Jesse Tree devotion for the 1st day of Advent. Then we will move on to Advent activities. The Root of Jesse~ We made our ornament out of a toilet paper tube, green paper, and brown yarn. The shoot of Jesse (By Amber Dover)~ “We have a family tree. I don’t mean a real tree in the back yard. I mean that our family is like a tree. You, children, are like branches on the tree. You ever notice how little branches come out of bigger branches. Well, your Dad and I are the bigger branches that you come out of. Your grandparents: Nana and your Papa that died, Granny and Papa, are the branches your father and I came out of. Mommy came out of Nana and your Papa that died. Your Dad came out of Granny and Papa. We could go back further. Nana came out of Granny ________ and my Grandaddy that died. Your Dad’s parents came out of their parents. We can go all the way back to your great great great great great grandparents, all the way back to one of Noah’s three sons, probably Japheth. Then go back to Japheth’s great great grandparents, all the way back to Adam and Eve…the root. The beginning of all humanity’s family tree. Sometimes bad things happen in families. Sometimes family trees are broken down because of hate, jealousy, divorce, and other bad things. Well, Jesus’ family tree is no different. Jesus’ family tree is full of all kinds of people, some Jewish, some Gentile (non-Jewish). Read the verse please. Jesus’ family tree goes all the way back to King David and then to David’s father, Jesse. This is why we celebrate with a Jesse tree. But David’s family was broken by bad things. The family tree of Jesse was more like a stump, a tree that has been cut down. It seemed dead…no more kings for Israel. God’s people were waiting for hope, for salvation. They were slaves to Rome. They wanted a King. God had a plan. God the Father, was going to bring the dead family tree of Jesse back to life. A king greater than David would come, a King that would rule God’s people forever. This King would first rule in people’s hearts before He ruled a new world. Jesus, the greatest king, grew out of the dead family tree, the stump of Jesse. He grew like a green shoot, a new family tree came out of the dead one. This family tree wouldn’t be broken though. It would be a spiritual tree, with spiritual children to be the branches. Jesus would bring people to Father God, to be God’s children. Jesus’ kingdom will be in hearts and one day in Heaven. It is a perfect kingdom. This family tree is a tree of eternal life. The Christmas Box~ This will be my second year reading The Christmas Box to my family, and the first time I’ve read it to Leeland. This special book by Richard Paul Evans was given to my Dad by my Aunt Lynn. It was 1996 and I was almost eleven years old. At that time in my childhood my Dad was an absent father…always traveling or out with friends (he changed later). So I was amazed when my Dad took the time to read The Christmas Box to me each night. I was also struck by the parallel of how the main character was a distant dad who learned to appreciate his daughter. My Dad then made two Christmas boxes for my aunt and grandma. After Dad died, my grandma (Mema) gave me her Christmas box. I keep memorandums of my Daddy in it. I love this book and the movie. I cry during both. It is hard for me to finish up the last pages without bursting into tears. My sons have no clue what it’s like to have a absentee parent. They are vaguely aware of how blessed they are. I pray one day they will appreciate me reading to them. It may take them longer to learn the lesson of The Christmas Box. I learned it at eleven and have never forgot. Snowflake Lesson at our Homeschool Group ~ My friends Melina and Michaelia put together this cute lesson. The kiddos enjoyed snowflake cookies and hot chocolate. They listened to Mrs. Michaelia read a book about how snowflakes are made. The kids made fake snow out of baking soda, glitter, and conditioner. Leeland just played with the baking soda. I didn’t want him getting too messy. It was grocery day. I made this snow scene out of a plastic bowl from the Dollar Tree and a Happy Meal toy with cotton for snow. I made a tomato cage Christmas tree from dollar store garland, ribbon, and lights. The tomato cage was leftover from our garden. I’m so glad I didn’t throw it out! I apologize for the blurry pictures. My family made hot chocolate and loaded up to see Christmas lights. The house we wanted to see had its lights down because of wind damage. So after driving across town we decided to check out the fireworks show on the River Walk. We walked far enough to see them in the distance. Then we hurried back to our van before the crowd left the show. Leeland was amazed and kept saying wow! It was super cold out. Now, for some toddler fun! Turn it over for chalkboard writing and erasing. Leeland really liked to erase. Christmas Pretend Play~ I bought two Christmas boxes that look like houses from the Dollar Tree. Leeland enjoys putting his Christmas toys inside. We also have a fake igloo that came from a Michael’s Craft Store set. I put it all on fake snow (cotton batting) and brought out his polar bear and penguin toys too. and don’t forget to curl up with a good book! Also featured in this post: detachable sleeves! I bought Christmas socks from the Dollar Tree(I really like that place! Ha!) and I cut off the foot part. I use the leg part for sleeves. They can also be leggings to put under thin pants. Well, I hope you’ve enjoyed celebrating with us! Join me tomorrow (Lord willing) for day 2. I’ll share the link here once I’ve posted it.